Some of you may have seen the recent albums posted on facebook which give a small taster of the first phase of our project. We started works on the 5th of March 2012 and hacked at the building relentlessly for 4 weeks. The gutting job was much more extensive than we ever planned and were literally left with 4 outer walls, no roof, barely no foundations and to top it all we drilled through our sewage pipes (not nice!). 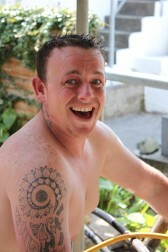 Oli has been on site most days shoveling gravel and tasting dirt… God it’s a hard job! His hands and back are aching like hell and he discovered muscles he didn’t know existed! Planning has been approved at last, meaning that we are now focusing on big structural works. The new steels are now in place and we have started the roof extension. 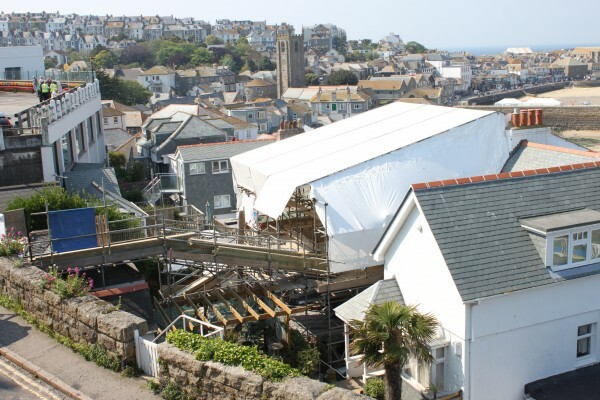 It’s a good thing that we decided to wrap up the building completely under a scaffold, as this has allowed us to progress steadily with works despite the ever-changing british weather! Angela? Well… She has been pretty busy too… on top of research for building materials, quotes for jobs, sourcing second hand furniture, attending auctions etc, she is also making sure that our family increases in size, as we are expecting in September!! Why make our life easy, when it can be delightfully complicated!! 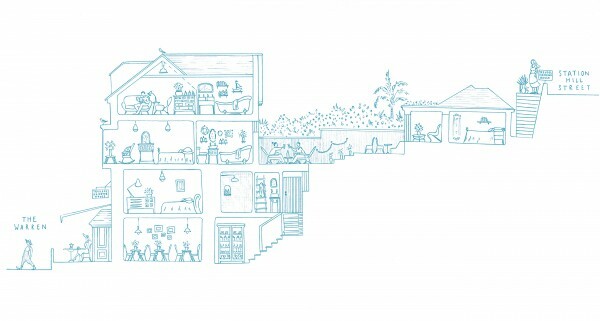 We thought you would like to picture the place, so check out this cross section illustrated by Alice Alderson who is working with us to create a series of drawings for our website and future brochure. Some of you may have seen images of our mammoth marmalade production for next year’s opening that we prepared in February. End of June will be the perfect time to enjoy fabulous local juicy strawberries and no doubt we’ll be back in the kitchen preparing some yummy jam to serve with our cream teas! We’ll make sure that you won’t need to wait as long for our next blog and, at the speed things are going right now, there will be lots to share. Enjoy the summer and see you all soon! It’s looking wonderful – and the builders look cool too! Wishing you sweet rewards – you certainly deserve them. So lovely to see you in front of a lovely spot at the seashore. All the three of you do look wonderful? Leila or little Angela? She looks so much the same as you Angie. 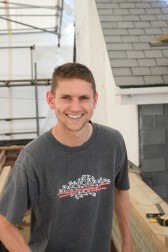 Your website is very nice with the pictures of the hard working builders, including Oli!!! And the drawings. Exciting also to see your guesthouse in the middle of the other buildings. Wishing you good luck, lots of succes and joy creating this special dream of both of you. Dikke knuffels voor jullie drieën van Peter en Heleen. Congrats on the progress you are making and above all on your little bun in the oven! You will certainly have your hands full but so much to enjoy! Can’t wait to taste some of that yummy, homemade marmalade/jam. 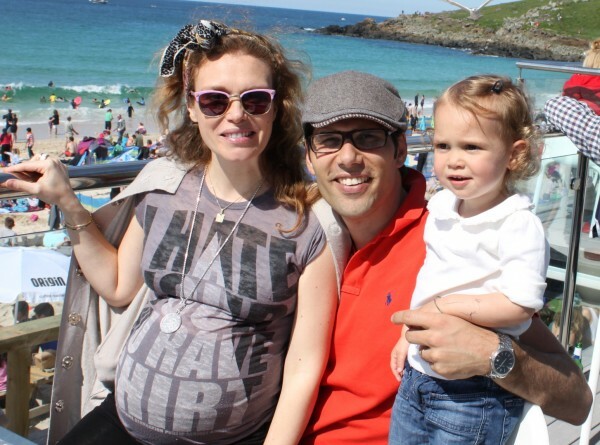 Hi Leila, Angela & Olivier – Congratulations with the blog, the project and the pregnancy. It all looks fantastic! We can’t wait to come and visit. All the very best. It was indeed delightful to meet you both at the Honeypot. I wouldn’t say that we are relaxed – as we approach the end of the works, we are experiencing our fair share of emotional and financial stress but we will get there in the end. Do pop in to see us for a coffee around Feb/March when we open.